A blog in the rainforest of Naikoon Park in the McIntyre Bay on Graham Island during a journey to the Queen Charlotte Islands in BC. Rainforest Bog, Naikoon Park, McIntyre Bay, Graham Island, Queen Charlotte Islands, British Columbia, Canada. 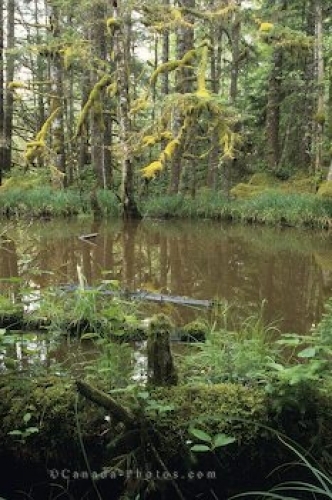 Photo of a small pond in the rainforest of Naikoon Park in British Columbia in Canada.